The heart and soul of a unit. This one has lost all his soldiers. Commanders are the hearts and souls of units. If a commander dies, their whole unit is lost permanently. They are invulnerable so long as at least one unit is under their command. Even if all soldiers of a commander die in battle, they will be regenerated on the next island or after regenerating in a house on the island for a specific time. As such, make sure that your commanders always survive! Commanders may flee with their surviving soldiers by clicking on the skill followed by an empty embarked boat. The boat must be big enough to carry all the units alive in order to flee. Archer can still fire at and from a fleeing boat. 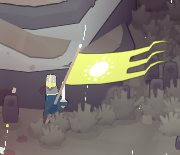 New commanders can be recruited on islands that have little flags under them, which indicates that this island is this commanders home island. Commanders cannot flee from their home islands; make sure to bring enough support to win the island if you want to recruit the commander! (Note, that you will only be allowed to bring up to three units of your own, instead of the usual 4, if you fight on an island with a local commander. The local commander will automatically be the 4th unit.) The local commander can not flee from the island they live on and must defend it with their lives. Newly recruited Commanders usually come with a number of coins already (to level them up quicker) and a unit of Recruits, though some may have a specific unit class preset, like Infantry, Pikes or Archers. Commanders can be given items; choose wisely, as items cannot be removed once added to a unit. Always a melee unit, regardless of unit class he/she commands. As such it's possible the Commander can kill units with their sword even when within a Spear or Archer unit. Can be granted items and as such give advantages or new skills to units. More hardy than the soldiers they command, able to take quite a beating before falling. Always a melee units, regardless of unit class he/she commands. No shield, regardless of unit class he/she commands. The rest of the unit cannot recover inside of houses without the Commander inside with them. If the Commander is separated while performing a Recover and killed the unit is considered killed.